Apple CEO Tim Cook: As of late, it seems like Apple Inc. (NASDAQ:AAPL) just can’t catch a break. As we have reported over the past few days, Apple has lost its spot at the top of this list while not doing any favors for the companies it works with. With all this in mind, many are hoping for good things next Tuesday during the Apple Inc. (NASDAQ:AAPL) earnings call. Of course, anytime a company goes through so many struggles in a short period of time, people begin to look at Apple’s CEO. And this is exactly what is happening with Apple. It is safe to say that all eyes are on Tim Cook at this time. Does he have what it takes to bring the company out of its funk, despite the fact that shares are below $400? 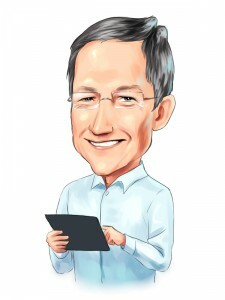 Bloomberg TV recently featured Apple CEO Tim Cook in its “Movers and Shakers” report. This has become a popular segment and is well worth watching anytime you get a chance. If you don’t have time to watch the video right now, here is what Bloomberg’s Betty Liu had to say about Tim Cook, the fall of Apple stock, and increased competition. With this view of Apple Inc. (NASDAQ:AAPL), it is hard to think about the company and not put some of the blame on Tim Cook. Of course, all of the troubles that Cupertino is facing cannot be caused by the guy at the top. For example, we discussed how the smartphone industry is going through a rough time in this piece. In other words, there are factors outside of Apple’s control. For now, Tim Cook is being looked upon by many to right the ship and get Apple back to its winning ways. Do you think he has what it takes? Apple Tablet Sales: Apple Can Rely on PC and Tablet Sales in the Future, Right... How Verizon Communications Inc. (VZ) Is Aiding the Dow Jones Industrial Average... Apple Inc. (AAPL): Calling Bottom Is Dangerous What If Apple Inc. (AAPL) Traded Like One of These Companies? Apple Inc. (AAPL), Cirrus Logic, Inc. (CRUS): Why Did My Stock Just Die? What to Expect of Apple Inc. (AAPL)?